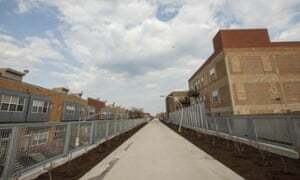 At 2.7 miles, Chicago’s Bloomingdale Trail is more than twice the length of New York’s High Line, and as the final touches are made to it before its June opening, the city has been trumpeting its achievement. At the turn of the 20th century, a copywriter and budding author living in Chicago’s Humboldt Park neighbourhood came up with the concept behind one of the most famous children’s books of all time: a yellow brick road. Some 115 years after The Wizard of Oz by L Frank Baum was published, an alluring pathway (though of a different hue) is about to become reality – just one block north of his Humboldt abode. 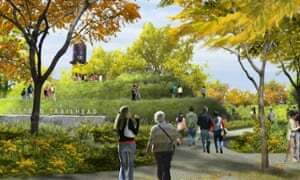 On 6 June, Chicago will open the Bloomingdale Trail – its eagerly anticipated answer to New York’s High Line – with processions and a street festival. Like its lauded Manhattan counterpart, this is a new thoroughfare grafted onto a defunct railway line, about 20 feet above street level. But as Chicago’s officials are eager to point out, at 2.7 miles it’s more than twice as long as the High Line and yet, at $95 million (£63 million), cost less than half as much to develop. On a sneak preview of the trail this week, planting was in full swing. There will be more than 450 different species of flora up here by the time the trail opens, and experts from Chicago’s Lincoln Park Zoo are busy fitting “critter cams” to monitor the wildlife it will inevitably attract. But above all, White is excited about this being a space where people can “walk, run or cycle swiftly and safely between communities”. 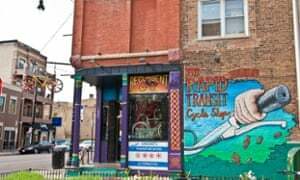 The communities in question range from densely suburban Logan Square to the west, through Humboldt Park and Bucktown to the hipster haven that is Wicker Park at the eastern end. The “man behind the curtain” in this story is Chicago mayor Rahm Emanuel, who made the aerial greenway one of his key campaign promises when he took office in 2011. The Bloomingdale Trail fits neatly into the city’s bigger 606 project: six ground level parks and a number of art installations all linked to each other – and the trail – by a system of ramps. The 606 moniker comes from the three-digit prefix attached to all Chicago zip codes. A CGI rendering of the trail at its western end. There’s a little over a month for this fallow brick road to bloom, but when it does, New York’s High Line might just have to up its game. Emerald or not, the city that worked its magic on Baum all those years ago is going green in a big way.